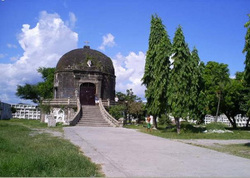 The simborio is the one of the attractions that can be found in the Sta. Ana Catholic cemetery. It was built by the Filipinos that were supervised by the Spanish friars in the 1700s. The dome was made of tiles and walls of stones. Its structure is 12 meters in diameter. It has retained its old-fashioned, mystifying appeal despite the minor repairs in the 1980s and in 1993.